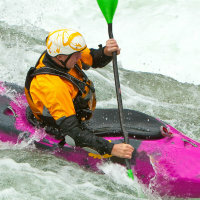 Kayak Accessories - PFD's, Spray Skirts, Dry Bags etc. 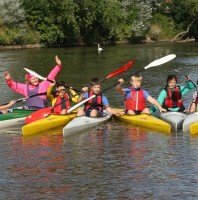 If you are new to paddling knowing which canoe or kayak accessory is essential, which is really useful, and which is just a "nice to have" will help you spend your money wisely and make your paddling life stress free and fun. You'll find a brief run down of a variety of options here with links to pages of more detail on some of the items. Paddles have their own section. Whatever time of year it might be time to start your birthday or Christmas gift list! 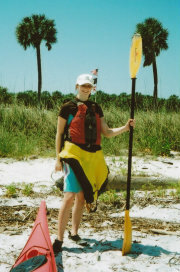 Top of your list of accessories will be a PFD, Buoyancy aid, life vest, life preserver call it what you will. If you learn with a centre they should provide you with a PFD and not allow you out without one. If they don't you need to question their safety policies. As soon as you start to venture out with your own kit you need to purchase your own life vest and be sure it fits well. Follow this link to learn more about this important piece of kit. What comes next on your list of essentials depends on what type of paddling you are going to be doing. If you are going to be a white water paddler or use a closed cockpit sea kayak you will very soon need a spray skirt but if you are going to paddle calm waters in mild weather or use a sit on top you will never need one. More on this here. Your boat will probably come with a seat already fitted, however you want your seat to be comfortable and right for you. If you paddle a racing boat seats are very individual some with padding, some without, different heights, different shapes etc. In a slalom or white water kayak you might want to pad the seat out to fit your hips exactly and have an adjustable back rest set to suit your size and shape. 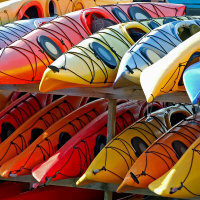 Open canoes and kayaks set up for fishing will have different requirements again. So there is plenty to think about which we delve into in more detail here to make sure you are set up just right for a comfortable time in your boat. To get the most out of your paddling your footrest needs to be set up to fit your leg length. Most boats come with these already fitted but if not you need to get this sorted. The footrest is usually adjustable or pre-moulded into the boat with a variety of mouldings at different lengths one of which will be about right for you. Make sure you fiddle around and set the footrest up correctly. Generally you should be sitting with your knees bent so that you are able to exert pressure through your foot without your leg locking out completely straight. The basic good effective forward paddling stroke starts with a push on the footrest. Whether you are out for a relaxing cruise or racing your way to medals your paddling will be more comfortable and more effective with a footrest. Unless you have a club where you keep your canoe or kayak, or unless you are lucky enough to live right on the waters edge you will need to transport your craft from home or wherever you keep it to wherever you are going to paddle it. A roof rack with or without a set of roof bars are the most likely method of transport for your kayak or canoe and we have a whole section dedicated to storage and transport of your boat. A quick read of the relevant section could save you quite a bit of heartache buying the wrong fittings or struggling to sort out the right set up. If you are going to be coming off the water in wet kit on a regular basis and piling your wet kit into the car to get home a dry bag can save a lot of puddles in your trunk. You can buy special dry bags that seal at the top and don't let water in or out. However, this is not essential. Its not something we have ever owned! For many years we used some well washed out bags that had held garden peat. They were tough and lasted and lasted. They were not very trendy though! Recently I have made a couple of big bags in cheap waterproof material with a draw cord at the top. They hold a huge amount of wet kit (as is needed with a family of three away for a weekend with several session on the water). Many of our friends just use bin bags! Depending upon where you plan on paddling and what the climate is like you may want to invest in a windproof or waterproof. Here in the UK any but the most fair weather paddlers will be much more comfortable if you have at least a windproof and in cooler conditions or on white water or longer trips a waterproof. 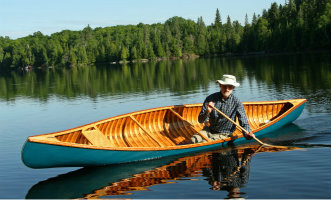 There are lots of styles on the market made especially for canoeing and kayaking. However, even just a cheap light cagool will make a big difference. I'm tempted to put these in the essentials section but it does depend on where you paddle. Many paddlers start off using an old pair of trainers or sneakers / pumps. These however can take a long time to dry out between sessions. A cheap pair of beach shoes will dry out much more quickly and do a pretty good job. Some paddlers will go bare foot but I've seen plenty of cut feet, stubbed toes etc. and much prefer something even if its quite thin between my feet and the bank. If its a cooler climate then neoprene beach shoes or booties will keep your feet much warmer than anything else. PDFs, Bouyancy Aids and Life jackets come in a range of sizes and designs. White water paddlers and Sea Kayakers will know how important it is to find the right Spray Skirt. Next best thing to your own paddles is a comfy seat for all day paddling. There are some really good waterproof digital cameras on the market. Just be sure to check that the waterproof battery covers and memory card covers are fully closed and that you have them attached to something to ensure they don't go to the bottom of the river, sea or lake! For action shots GoPro make great video cameras although they don't come cheap. Kayak accessory geeks will love fiddling with their garmins. Garmins or equivalent gadgets can track where you go, how fast, heart rate and all sorts of other features. Hot on the heels of the garmin however is the iphone in a watertight case with downloaded apps that enable you to measure all sorts of stats that our racing paddlers love to use to let them know how their training is going.